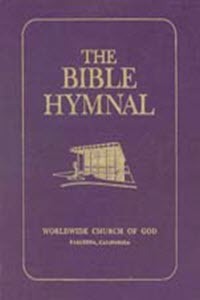 "Worldwide Church of God Hymnal (1974)"
008 I WILL PRAISE THEE, O ETERNAL! 009 DECLARE HIS WORKS TO ALL NATIONS! 013 HOW LONG WILT THOU FORGET ME, LORD? 014 WHO SHALL DWELL ON THY HOLY HILL? 051 JOYFULLY SING AND PRAISE GOD! 058 HIS NAME IS GREAT! 062 PRAISE THE ETERNAL WITH A PSALM! 064 RISE AND JUDGE, ETERNAL ONE! 066 O LORD OF HOSTS, MY KING, MY GOD! 069 HOW LONG, ETERNAL, HIDE THOU AWAY? 073 THE LORD ETERNAL REIGNS! 074 SING PRAISES AND REJOICE! 078 HE SHALL REIGN FOREVERMORE! 082 O GIVE THANKS AND PRAISE THE ETERNAL! 084 O THAT MEN WOULD PRAISE THEIR GOD! 088 PRAISE BELONGS TO GOD! 090 O HOW LOVE I THY LAW! 105 WHERE SHALL I GO FROM YOUR SPIRIT, O GOD?